Robert Adelman Hancock and the adorable Megan McGinnis in Daddy Long Legs. Photo: Meghan Moore. 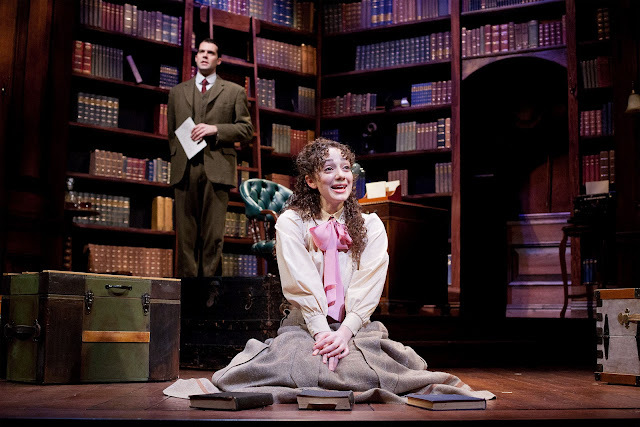 This is just a quick note to let you know that by far the most enjoyable show in town right now is Daddy Long Legs, up in Lowell at the Merrimack Rep. I won't make any false claims as to its depth or artistic greatness - it's just a sentimental, charming evening out. But what charm it has got. Sometimes, you know, it's enough (more than enough) to simply see a show in which everything is as it should be, in which everything has clicked precisely into place. Perfect script, perfect direction, perfect cast, perfect set - it's a special kind of theatrical pleasure. I admit the music's so sweet you may get a cavity, but you will leave smiling nevertheless (that's a guarantee). I'll save a full review for later, but I thought I'd let you know as I've heard good seats are already hard to find for this one, and it only runs through March 4.